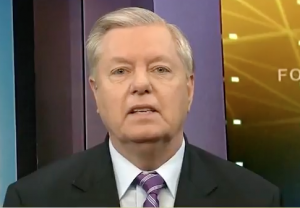 Sen. Lindsey Graham (R., S.C.) predicted Friday that President Donald Trump would bring a conclusion to the North Korean nuclear crisis by the end of his first term, saying he would go to war if necessary to secure the United States. Trump called off a planned June 12 summit with North Korean dictator Kim Jong Un on Thursday. He cited recent belligerent rhetoric from the regime following months of warming relations. The Trump administration has pushed for Kim to denuclearize, while promising security and prosperity in return. Graham told radio host Hugh Hewitt that Trump felt North Korea was "playing him" and so he cancelled the meeting. To contextualize Trump's thinking, Graham recounted a meeting he had with Trump and former National Security Adviser H.R. McMaster shortly after he took office, where he told him North Korea was his "most acute problem." "And he turned to McMaster, and he says what do you think? And he says I think we need to get them to give up their nukes for the good of our security and the world at large," Graham said. "He’s made a decision, the president has, that he’s going to end North Korea’s nuclear program. It’s only a question of how and when." Graham relayed two possible solutions: a diplomatic one, working alongside China, to peacefully get North Korea to give up its program, or, if North Korea insists on having a nuclear capability, "we use military action which would be the total destruction of the regime." "I personally believe having talked to the President as of yesterday, that he’s going to bring this to conclusion in his first term," Graham said. Graham said Trump had recognized he had to take the North Korea nuclear capability off the map for the sake of world security, noting terrorists can acquire nuclear weapons through purchases from rogue regimes like it or Iran. "If it takes a war to end that nuclear threat, so be it. And the war will be over there," Graham said. "The people dying will be over there, and he doesn’t want to do that. But he’s going to pick regional conflict to secure the homeland. I hope people understand that."